There are several measurements to take of one’s staircase to determine what size stair lift unit to install. The first measurement should be the length of track from the top to the bottom of the steps. The second thing to measure is the height, tread, and width of the steps. Some stair lift companies send their employees to do the measuring themselves. It is best to have two people perform the measuring. Start by standing with the measuring tape at the top of the stairs on the landing. Put the measuring tape roll on the end of the landing step and have the second person extend the measuring tape down the stairs. It is important that the measuring tape is touching the edges of each step during the measurement. Have the second person stretch the measuring tape to the landing at the bottom of the stairwell. Record this value. Start by standing with the measuring tape at the top of the stairs on the landing as in Step 1, with the tape on the edge of the landing. Have the second person extend the measuring tape down the stairwell to the top front edge, of the bottommost step. Record this value. Start at the top of the stairwell on the landing. Put the measuring tape on the edge of the landing step, and extend the measuring tape to the nearest wall (or door or fixed object) to figure out how much clearance is at the top of the stairwell. Record this value. Start at the bottom of the stairwell on the landing. Put the measuring tape on the floor, against the bottommost step, and extend the measuring tape to the nearest wall (or door or fixed object) to figure out how much clearance is at the base of the stairwell. Record this value. Take measurements of the width of the steps. Most should be the same or around the same width, but take care to measure each step and record the values individually. Take measurements of the height of the steps (from tread to tread). Most should be the same or around the same height, but take care to measure each step and record the values individually. Take measurements of the depth of the steps. Most should be the same or around the same in depth, but take care to measure each step and record the values individually. It is best to double-check the accuracy of the values by measuring everything twice. The other consideration for sizing is determining whether a standard size or a heavy duty/high weight capacity stair lift will be most suitable. Standard size stair lifts usually hold up to 300 pounds, versus heavy-duty stair lifts which are typically capable of supporting 500-600 pounds. They feature wider seats (23-25 inches wide versus 20-22 inches), and typically require a staircase that is 36 inches wide at a minimum to fit the larger-size lift and carriage. If the user is tall, seat depth might be yet another factor for consideration. If there are other individuals who will be accessing the stairs on foot, the amount of space it takes up will be an added consideration. There are models of stair lifts that fold up compactly to allow plenty of stairwell space for other family members or guests to go up and down the steps, such as the Harmar SL600 Pinnacle Premium Stair Lift which folds to take up just 11” of staircase room (width). There are some lifts where the carriage (seat) curl around the tops and bottoms of the staircases, out of the way of the steps, thus providing a clear route for others to use the stairs without obstruction. There are two types of staircases, straight and curved. This is one of the biggest considerations when determining which stair lift would be needed. The lift for a straight flight of stairs goes up and down in a straight line. It is not able to turn around curves, bends, or travel across a landing. A curved stair lift is able to navigate corners and reversal of direction in the stairs. The curved stair lifts tend to cost more money due to their more complex nature, and the fact that most need to be custom designed and built. According to Jim Miller of the Huffington Post, the price difference for the two types of stair lifts is as follows: straight stair lifts typically range from $3,000 to $5,000 while curved lifts can cost between $8,000 to $15,000. In a 101Mobility.com article, certified Aging in Place Specialist Gordon Raney discusses the money-saving option of purchasing and installing two straight lifts for stairwells with a middle landing, instead of paying for a curved, custom job stair lift. It would require enough space on the middle landing for both chairs to sit side by side, as well as ample room for the user to make a safe transfer from one chair to the next. The rails of the stair lifts are typically attached to the stair treads themselves as opposed to the wall. A Seniors Living Independently article states that there are no longer any known stair lift models on the market that attach to the wall, although older versions did. Most stair lifts can be installed on either side of the stairwell. The chair portion of a stair lift is generally referred to as the “carriage,” according to Wikipedia. Consideration should be taken as to the carriage design, such as height of the seat, manual versus power swivel of the seat, and safety hitches to ensure that the lift won’t start moving until the carriage has been securely locked. A seat that swivels is very important to the safety of the user. The majority of stair lift seats face away from the wall or banister, towards the stairwell. If the seat does not swivel, the user may need to get in and out of the carriage from either the top or bottom stair step. Entry and exit into the carriage from the steps as opposed to the landings poses an increased risk of falling. Seats that swivel allow the user to turn the carriage away from the stairs, towards the landing, so that they may safely sit down and stand up on a flat, level and wide surface. Since the seats swivel upon arrival to the top and bottom of the stairwell, there are safety locks that ensure the seat will not twist and turn as the carriage is traveling up and down the track. The height of the chair must be low enough so that the user can sit down and stand up easily. If the chair height is either too high or too low, a disabled user may have trouble getting in and out. Sometimes there are options to adjust the seat at the time of installation to the user’s height specifications. Most, if not all, stair lift carriages come equipped with a seat belt as a safety precaution. It is important for the user to fasten the seat belt during any time of use to prevent falls from the chair, and wait for the carriage to come to a complete stop and lock into place before unfastening the seat belt and standing up. For some people, a stair lift may not be a necessary part of every day life but certain circumstances call for it. ThisIntentionalCaregiver.com article discusses the option folks have to rent short-term (or long-term) stair lifts for their homes. This would be a viable solution for when elderly relatives come to visit and stay for a period of time, or even after a surgery or injury where the recovery is expected to be complete but in the interim, the individual is left with little mobility. Prior to installing a chair lift, some people might not have used the second stories of their homes for some time. It can be an adaptation in and of itself relearning to utilized both stories into every day living. As a consideration to others who may use the stairwell, consideration should be taken as to how the carriage will be stored. Some fold up compactly when not in use, allowing a wide pathway for foot traffic on the steps. Other people might prefer to simply use a remote control to send the carriage either up or down the stairs, where it will be out of view and out of the way. Many of these adaptations are not hard and fast rules, but rather subjective preferences that users and their families will explore and learn along the way. Stair lifts come equipped with many different features. 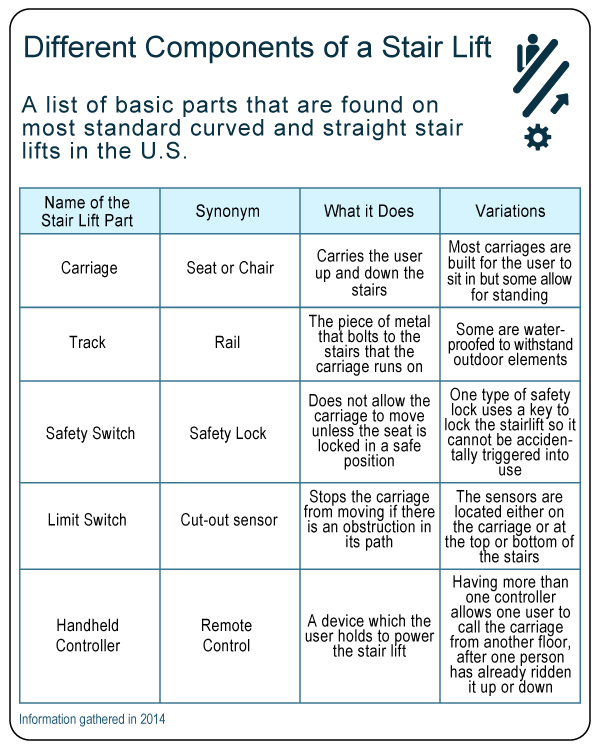 Figuring out what is most important, or integral to the successful usability of the stair lift, is helpful for narrowing down the selection. Many stair lifts come equipped with a special key feature wherein the carriage will not move unless the key has locked it into place. Some models come with hand-held remote controllers, which the user can use to send the carriage up or down the stairs, with or without the user inside. And even other stair lifts allow users to stand instead of sit, which is helpful for narrow stairways or people who are unable to bend their knees easily. Wikipedia states that common, modern features of stair lifts include call stations, folding steps on the carriage, seatbelts, adjustable speeds, adjustable seats, and battery recharging stations. On some models there is the option to have the carriage utilize a “soft start” and “soft stop” option. Typically, one arm of the seat will house a control pad in the form of a switch or a joystick, from which the user can operate the stair lift. Users with lessened mobility of their hands may prefer the toggle style of lever, as it makes for easier handling than a switch-style. Many units will also come with hand held remote controls so the carriage can be called for or sent to the other end of the stairs while not in use. Carriage- The carriage is the term commonly used for the seat, or platform, part of the stair lift that carries the user up the stairwell. Track– the track is the long, grooved metal portion of the unit that runs up the stairwell. The seat of the unit is attached to the track, and the seat moves up and down the metal track carrying the user. Typically, the track is attached to the actual stairs themselves, not to the wall. Cycle- A cycle of a stair lift is one roundtrip of an ascent and a descent (1 up, 1 down.) Manufacturers will refer to stair lift cycles when speaking in terms of warranties, life span, and how long batteries will last. Stair tread- When discussing measuring for the stair lift unit, the term “stair tread” is used. The stair tread is the part of the steps that is actually walked upon, and there are specific ways to measure the tread to figure out the values for a stair lift track. The depth is the length from the edge of the step to the vertical, inside part of the step, and the width is measured from one side of the wall or banister to the other side. Swivel Seat- This type of carriage has the ability to turn either 45 or 90 degrees once it reaches a landing, allowing it to swivel away from the steps. This gives the user the ability to enter or exit the seat from the security of a flat and stable landing, as opposed to on the actual steps. Overhang- This refers to a piece of track that may stick out into a landing if the stair lift unit overhangs at the top step. The piece of track that protrudes can be as little as a few inches to over a foot, so consideration should be taken when figuring out spacing on the landings in the event of an overhang. An overhang could interfere with opening or closing doors that are close to the landing, or with the user’s ability to enter or exit a wheelchair waiting on the landing. Stand or Perch- Users who have a difficult time with sitting or bending their knees may prefer a carriage that allows them to stand instead of sit, or perch lightly on a higher seat. Heavy Duty Carriage- A stair lift that can accommodate more weight, usually with a larger seat. Typically the heavy-duty models can hold up to 500 or 600 pounds, as opposed to the standard size which tend to have a capacity of up to 300 pounds. Safety Switch- This safety feature is located on the carriage and is used to ensure that the chair is locked into a safe position for travel before the carriage begins its ascent or descent on the track. The safety will not allow the carriage to begin movement, or draw power, unless it is in the correct position. Footrest Safety Sensor- This type of security feature is located on the footrest of the carriage and works by stopping power to the unit if it comes into contact with any object in its path, be it a pet, person or any item left in the stairwell. Limit Switches (also known as Safety Cut Out Sensors)-These act as a safety feature that will interrupt the stair lift’s motion. The limit switches are actually sensors located at both the top and bottom of the track, and/or on the seat and footrest, that will cut the power to the carriage if there is an object obstructing passage. Lockable Isolation Switch- This safety feature is designed to prevent use of the stair lift when the isolation switch is locked by a key. Only unlocking the switch with a key will allow use of the unit. The lockable switch tends to be ideal for homes with children or even pets that may trigger the unit into use unintentionally. Hand-held controller- Many stair lifts come with a device not unlike a remote control that allows the user to operate the stair lift while not actually seated in it. Hand-held controllers allow users to send the carriage up the stairs and out of the way when not in use, or call it to the bottom of the steps from the top. Call/Send controls- This type of control panel is mounted to the wall, unlike the hand-held controller, but allows for the same ability to send and call for the stair lift from another point other than while seated in it. Summoning the carriage from a wall-mounted panel can be very useful especially when the stair lift is being used by more than one person, e.g. when one individual takes the stair lift downstairs in the morning and leaves the house. The second user could then call the carriage to ascend the track and arrive at the top of the stairs for their use when they are ready. Contact Pressure Controls- This type of control panel is one that requires the user to actually be pressing a control (usually located on the seat arm) for the carriage to move along the track. If the control button or joystick is depressed, the carriage will not move. Thus, constant pressure must be maintained for the carriage to travel the length of the track. 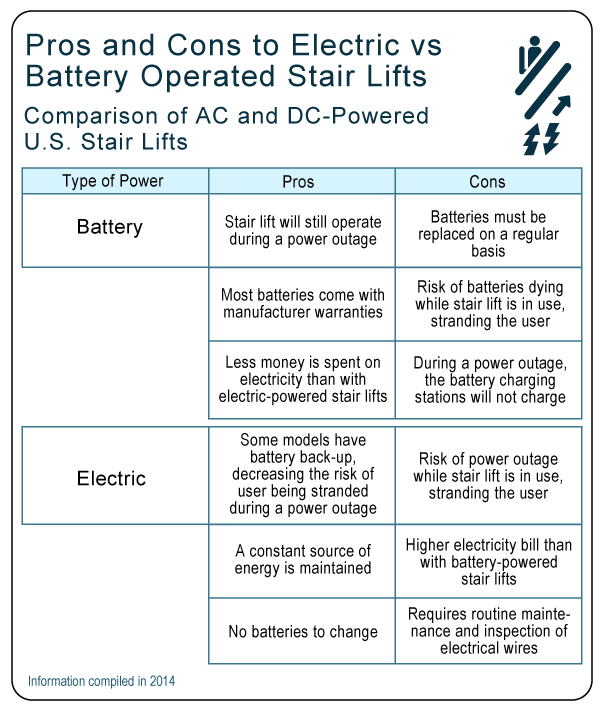 Stair lifts can operate on one of two types of power sources, either battery or electric-powered. Both have pros and cons. Battery-powered stair lifts allow users to continue to use the unit even during power outages. The batteries do need to be replaced on a regular basis, and there is a small risk of the batteries dying while the unit is in use, stranding them. Electric stair lifts have a fairly constant power source except in the instance of an electrical outage, again running the small danger of stranding the user mid-use or more likely prohibiting them access to one level of the home for the duration of the power outage. The most advanced stair lifts have a rechargeable battery inside that is constantly being charged by the A/C current. These give you the best of both systems, A/C power for normal use, and a battery backup if the power were ever to go out. Stair lifts are generally used by people who have decreased mobility, and may be at risk for falling when using a stairwell. The Center for Disease Control and Prevention states that falls are the leading cause of injury to elderly adults, citing that at least one in every three adults over the age of 65 falls in a year. Medicare does not cover the cost of stair lifts, according toTheLawDictionary.org, because it is labeled as a home modification instead of a medical expense. Private medical insurance companies may cover a portion of the cost of the unit and installation. The National MS Society advises looking into insurance coverage prior to the purchase, and obtaining a doctor’s prescription based on a health evaluation. 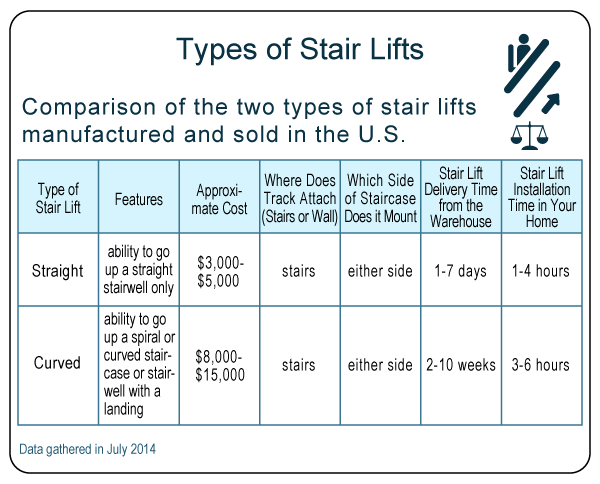 Maintenance costs to the user tend to vary depending on the amount of usage the stair lift gets. And laws vary from state to state with regards to whether or not the repairman must be licensed in a certain specialty. For instance, in Washington state the individual who installs the stair lift is required by law to be a licensed elevator contractor and any individuals who perform follow-up maintenance or repairs must be licensed elevator mechanics. But if a licensed elevator mechanic is required to inspect and perform maintenance on a stair lift, their average billable rate is between $85 and $250 per hour. By those calculations, a service call could be a minimum of $200-$250, possibly before the mechanic even fixes anything. The good news is that typically stair lifts tend to run free of issues for at least three to five years, and in that time if anything does arise the warranties may be able to cover the cost of repair or replacement. Warranties differ from manufacturer to manufacturer, and from model to model. However each model should have a clear warranty listed in its specs. Warranties will cover the batteries, rack (track), and components (parts) of the unit. The warranty will cover all or parts of the above areas, and can last anywhere from 2-5 years on average. The Harmar CSL500 Helix Curved Stair Lift comes with a warranty of 2 years on components and 1 year on the batteries. The Harmar SL600 Pinnacle Premium Stair Lift has a 2-year warranty on components only. And the Harmar SL600HD Pinnacle Heavy Duty Stair Lift comes with a warranty of 3 years for components, 10 years for the rack, and one year for the batteries. The life span of a stair lift unit tends to depend entirely on the amount of use it receives. Some users may find themselves using the stair lift only twice per day, while others may utilize it far more frequently. Manufacturers refer to one stair lift trip up and down the stairs as one “cycle,” and base their estimates for the unit’s life span on the amount of cycles performed as opposed to a certain amount of years. 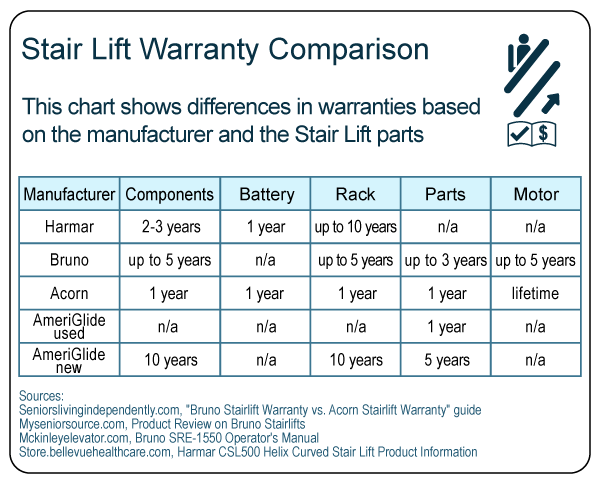 Many times, stair lift manufacturers will list the expected motor life span in the specs section of the product. If this information is not listed on a website or brochure it is important to ask how many years a specific motor is expected to be good for. 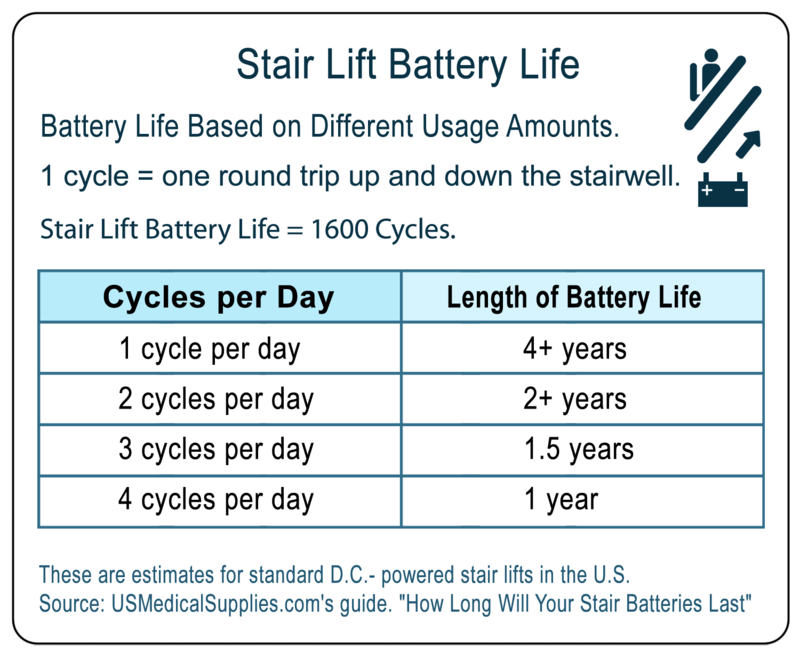 According to U.S. Medical Supplies, battery-powered DC stair lifts have batteries that tend to last for 1,600 cycles. Since cycle use varies from person to person, here is a helpful chart to figure out how long the average battery would last at the rate of usage.